'Bûka Baranê, means The Bride of the Rain in Kurdish. It is the Kurdish phrase used for the rainbow. 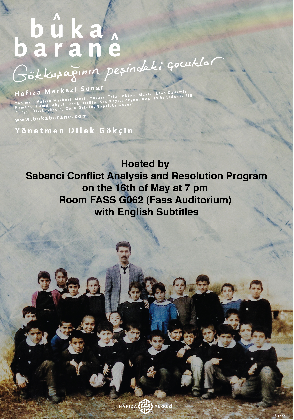 The documentary, begins with a photograph of primary school children taken in 1989 in the courtyard of their school in the village of Befircan or Karlı, to use its given Turkish name, in the Yüksekova district of Hakkari province. In a corner of the photograph it is possible to see the rainbow that comes out after every fall of rain in this region. 23 years after the photograph was taken, one of the students in the photograph (İrfan) returns to the village for the wedding of another student (Aysun). Most of the other class mates in the photograph will be at the wedding with the bride Aysun too.